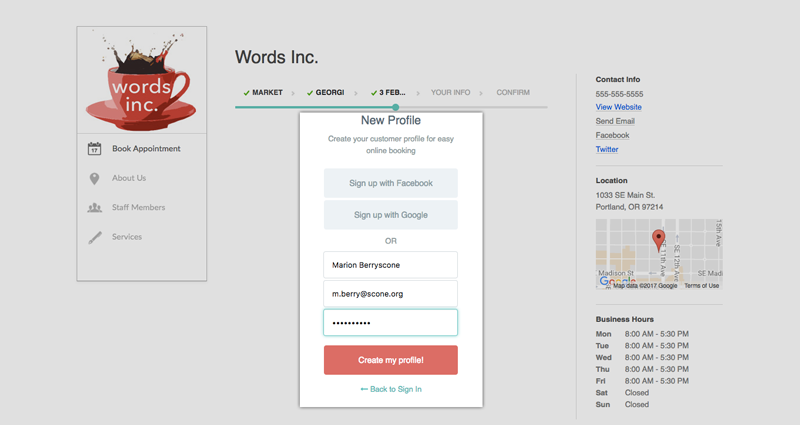 When customers book an appointment through your Booking Page, they can create a customizable profile and login with your business's Setmore account. This profile allows customers to upload a photo of themselves, see a history of past appointments, and reschedule or cancel current appointments. Customer logins are therefore useful for long-term returning customers to help make their appointment scheduling process easier and faster. They will also help cut down on repeat customer entries in your contact list. 1. Navigate to Apps & Integrations, and under where it says Your Booking Page, click the "Configure" button. 2. Click the "Booking Policies" tab and scroll down until you find the Customer Login feature. Click the On/Off switch into the "On" position to enable customer logins. 1. If you so choose, you may require customers to create and use their customer profile when booking appointments with your organization. To enable this feature, return to the Customer Login switch and checkmark the "Required" box. 1. When scheduling an appointment on your Booking Page, customers will be prompted to create a profile, or enter their username and password if they've already created a profile. 2. They can use the "My Account" menu to see their profile details or a schedule of past and future appointments with your business. 3. From the Schedule menu, they can also click the Pencil icon next to each appointment to reschedule or cancel it.